﻿ Online Advertising Models: CPC, CPM or CPA? Online advertising models show up on Web sites in several forms -- cost per click (CPC), cost per thousand (CPM) and cost per acquisition (CPA). Publishers and advertisers should know and consider all three depending on the situation. It’s clear that CPC and CPM dominate the advertising models. CPC in particular is the dominant form for major Internet players such as Bing, Facebook and Google. CPM is often preferred for other sites, especially ones oriented to content. CPC is popular with text-oriented ads that appear on search engines while CPM is popular with image-oriented banner /display ads. In the first case, the emphasis is on response. In the second, the emphasis is on branding. All advertising strives for some combination of branding and response. Cost per click is popular with publishers who use services such as Google AdSense, AdBrite, etc. It is especially popular with advertisers because of the ability to track return on investment. It is the primary form of advertising on search engines. The CPC model splits the risk between the publisher and the advertiser. A campaign with low clicks is bad for the publisher because it receives less revenue, while the advertiser minimizes costs. A high click campaign with poor conversion is great for the publisher, who maximizes revenue. But it is bad for the advertiser because of high costs and low returns. The goal, of course, is to split risk and reward as evenly as possible between the two parties. Otherwise the long-term relationship is more likely to fail. Contextual ads such as Google AdSense and Media.net can produce the equivalent of $1-5 CPMs per ad unit based on the clickthrough rate. The odds of getting there increase if the content is properly optimized. The advertiser places ads on Web sites via Google AdWords. It allows them to track the click-through rates, cost per click and conversion rate. Cost per click advertising in a direct sales environment often is less successful because of the high labor costs in setting up, tracking and managing the campaign. So CPC deals are worth considering for publishers, but they should be used only for certain types of list-like advertising likely to encourage clicks. Cost per thousand impression campaigns produce certain revenue for the publisher and uncertain results for the advertiser. It dominates the Internet landscape among content sites and is often used with large, brand-oriented banner ads. With Internet CPMs far lower than other forms of advertising, it can be argued that an advertiser doesn’t necessarily get a bad deal if the ad is put together correctly. Those efforts include strong graphics, effective call to action and the use of other response tactics such as putting a phone number in the ad. One other creative approach for the reluctant prospect is a hybrid of CPM and CPC. The advertiser pays a base CPM at a discount to the rate card, plus a CPC. That splits the risk more evenly between the publisher and the advertiser. 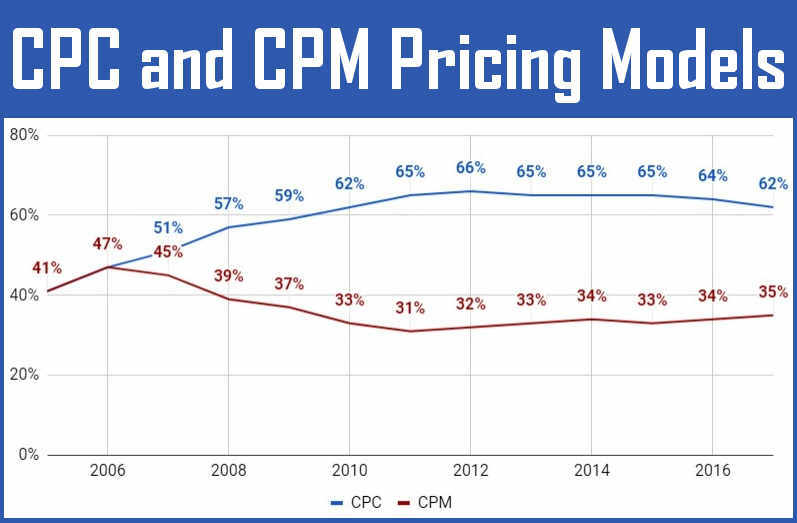 That said, historical data from the Internet Advertising Bureau shows that the use of hybrid CPC and CPM campaigns are declining. CPM works best for visual, branding-oriented campaigns while CPC is worthwhile for textual, response-oriented campaigns. Making the right choice could determine the difference in managing expectations for the client and getting them to sign a renewal to the contract. Which Online Advertising Model is Better? Cost per click advertising works well for search engines such as Bing and Google because they deliver contextual ads. In other words, they can place a single ad on a single page based on that page’s content. That contextual ad is more likely to get a click as a result because it is relevant to the interest of the person visiting the page. Site publishers who don’t have an ad-serving platform that can deliver a contextual ad to a single page or group of pages are more likely to see a low cost per click. They end up with less revenue as a result. So the ad-serving platform is a major consideration for a publisher who is trying to decide whether to sell CPC or CPM campaigns (or both). It’s hard to imagine why any advertiser is still pushing CPA or why any site is willing to consider it. The track record for CPA has been terrible. There are examples of where it has succeeded, but those examples are rare. CPA works for a small number of publishers who have succeeded in affiliate marketing. These publishers have found a niche with little competition and usually sell a highly targeted product or service. So yes, CPA can work in certain circumstances. But the odds of success using affiliate marketing are extremely low. Various online sources estimate that 95 percent of all affiliate marketers either fail at the effort or produce only a small amount of income. The problem lies with the fact that Internet advertising, like all advertising, is a combination of branding and response. CPA assumes that branding has no value. Further, it places all of the risk and responsibility for the sale on the publisher, while putting none on the advertiser. The result is especially tricky if their site is poorly produced. Advertisers of course love CPAs as an online ad model because they have all reward and zero risk. That’s why they flock to affiliate marketers such as Commission Junction. The high risk on the part of the publisher is why an exceptionally high percentage of affiliate marketing sites fail to survive. All three online advertising models have a place in any publisher or advertiser strategy. But they should be chosen with their respective strengths and weaknesses well in mind. Although the most popular online advertising model is CPC because of search engines, which one is actually best depends on the ad platform and other factors. CPMs work best for the publisher because they provide a guaranteed and predictable stream of revenue over the course of the agreement. CPCs work better than CPMs for the advertisers because they pay only for results in the form of clicks. They represent a higher risk to the publisher. CPAs work best of all for advertisers because they pay for actual results in the form of either leads or transactions. They represent the highest risk to the publisher. Is AdBrite in business today or were they purchased by a larger entity? Thanks. Yes, it’s gone. I don’t know if you used them, but I ran into problems with viruses attached to ads when I tried them. Networks with infected ads have a way of turning off potential clients. CPMs do not work good for every business. Thats why we need to test & measure for I say 20-25 days. We find CPM works great in niche markets where just getting eyeballs on ads in association with the site they are on is the win. ‘cool by association’ is the technique. Yep, contextual advertising is very effective. The hard part is getting the eyeballs with so much competition out there.